This is the photo-journal of a trip on an Excitecat 810 power catamaran from Connecticut down to Key West in late 2005 - 1600 nautical miles covered in a total of 125 hours under way. The Excitecat 810 used in this trip was Sound Catamarans' demonstration model, equipped with twin Yanmar 160HP engines and a full cruising package, including GPS, autopilot, chartplotters and full instrumentation at both inside and flybridge helms. As with most power catamarans, the Excitecat 810 offers exceptional comfort, stability, manageability and economy. 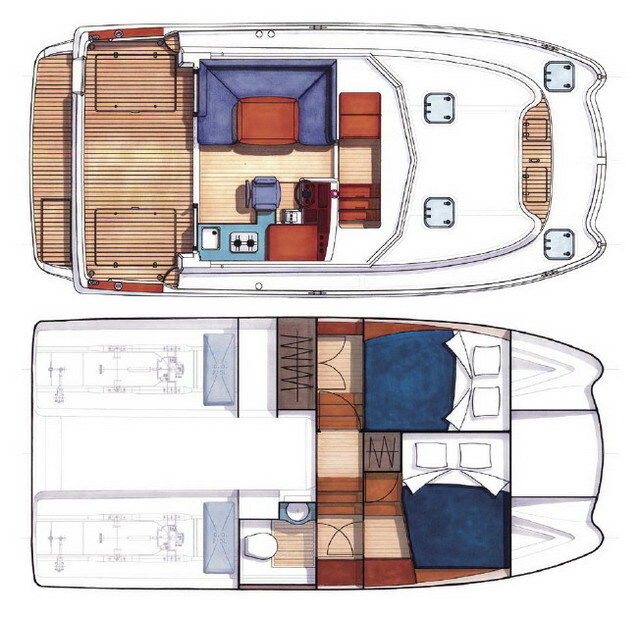 But what is truly unique about the Excitecat is the generous amount of interior accommodation in a boat of only 26' - including two private double cabins, galley with fridge, stove and sink, and a roomy head and shower compartment. From Connecticut to Annapolis, MD, I ran Nobeltec's Visual Navigation Suite electronic charting program on my laptop computer with data feed from a handheld GPS, in addition to the on-board Raymarine E-80 chartplotters. From Annapolis to Key West, I used only the the boat's Raymarine systems with Navionics Gold cartridges.. While using Nobeltec on my laptop, I recorded data every 15 minutes (including boat speed) and I downloaded this information to show graphically how the boat performed in offshore and open water conditions (see below). For the remainder of the trip, average speed for the day was calculated by tracking the boat's course on the Raymarine E-80 chartplotters and dividing by hours under way and this is recorded at the end of each day's run in the Journal. * including all warm-up, cool down, "idling" time, slowing for other boats, no-wake zones and Manatee Zones in Florida, waiting for bridges, re-fueling and maneuvering in marinas, anchoring, etc. Click here to start at the beginning, or click on a particular leg below to go directly to that section.